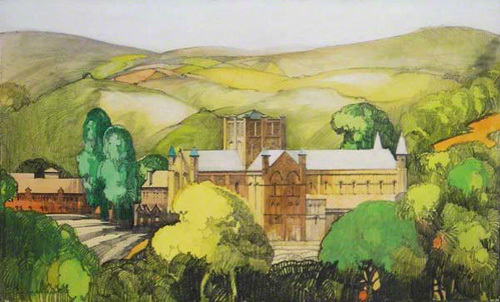 A view of Buckfast Abbey from a pastel drawing by Claude Buckle. Buckfast Abbey forms part of an active Benedictine monastery at Buckfastleigh, Devon, England. It is a major tourist attraction. This is one of the earliest drawing proposals of the railway poster and shows the shorter tower as it was in 1930. Buckfast Abbey has strong railway links as the South Devon Railway Trust; a charitable organisation operates a heritage railway from Totnes to Buckfastleigh in Devon, alongside the River Dart. Totnes also features twice as a pencil drawing and poster. Created in 1930.